They aren't a cure-all, but they do provide a sure-fire way to incite the troops to hit specific business targets. 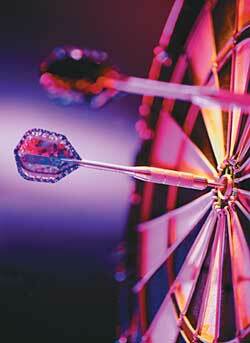 SUCCEEDING in today's business world requires clearer targets and sharper aim than ever before. This new era of business has ushered in vast changes and new challenges. Recession, higher turnover, increased competition, higher costs, and a changing work ethic have created the need for businesses to recapture the attention of employees and recommit them to quality and productivity. For all of these challenges and many others, incentives provide solutions. Designed to capture energy and purchasing power within a business-to-business framework and given time period, they influence behavior by offering very specific rewards for very specific activities. When properly structured, they are highly accurate in hitting their targets, and they provide a measurable return on investment. Incentives are wonderfully flexible. You can use them to address multiple business challenges (improving sales, raising productivity, increasing market share, reducing turnover, boosting quality, instilling loyalty, lifting morale, fostering teamwork, improving work habits, ensuring safety, decreasing absenteeism). And, you can use them to influence people at every level in your organization and distribution channel (salespeople, dealers, distributors, resellers, clerical workers, plant workers, executives, middle managers, administrative staff). Incentives aren't a cure-all; in fact, they work best when implemented as part of an overall strategy combining efforts in training, hiring, communications, research, and other key areas. But they do provide a sure-fire way to incite the troops to hit specific business targets. Incentives work because people want them. They want (and need) to be told what is expected of them and why, how they can meet expectations, and when they're doing a good job. By providing tangible awards for quality performance that is consistent with the company's short- and long-term goals, incentives accomplish all three. They also appeal to people's inner need for recognition and their desire to be part of a team. Most significantly, incentive programs enable companies to increase sales and profit without a substantial financial investment. Design ways to measure performance in relation to objectives. Communicate goals, standings, and other relevant information on an ongoing basis. Choose rewards tailored to the target audience. We are believers in the power of incentives. We have created the following information through our own experience and with other experts to help you better understand the step-by-step process that is necessary to create, implement, and evaluate a successful incentive program. Incentive programs don't operate in a vacuum. Before you do anything else, intensely scrutinize how, where, and with whom you do business. Introduce a new product or service to your regular mix. Generate new accounts or expand your customer base. Bolster sales in a slow season. Stay afloat in a poor economy. Improve the quality of a product. The list goes on. It's a good idea to write down as many needs or problems as you can identify. (There are very few legitimate business challenges that can't be addressed by an incentive program.) Once you have your list, select one or two of the most pressing needs. Unfortunately, you can't hit every problem in one shot! Examine these closely and be sure you understand their full implications. For example, you may have identified your problem as low sales. Exactly why are sales lagging? Is it because the consumer isn't buying the product, because of poor quality or high price? Is it because distributors aren't giving it proper attention? Or because retailers or dealers aren't giving it a full sales effort? Any of these and many other factors could change the aim of your incentive program. At this point, you should be ready to translate your primary needs and problems into program objectives. As you do this, keep in mind that all objectives must be: Simple. The old "KISS" rule applies here. Don't overwhelm your target audience with a list of five things you want them to accomplish. Focus on one or two goals. Specific. You may decide your goal is to have salespeople "sell more" or to have employees "improve safety." Unfortunately, this doesn't offer anyone in your target audience a clue as to what he really needs to do. Even an objective such as "We need to increase sales by 10 percent" will keep would-be program participants in the dark. Strive for a more specific objective, such as "Increase the sale of bulk resins to U.S. automobile manufacturers by 10 percent between January and June." This objective delineates the desired activity (to increase sales), the measured items (bulk resins), the expected "performance level" (a 10 percent jump in sales), and the time allotted to meet the goal (six months). In conclusion, you should: Intensely scrutinize how, where, and with whom you do business. Pinpoint your company's specific challenges or problems. Keep them simple. Develop primary and secondary objectives. Rules that are simple, fair, and easy to communicate. A measurement system that clearly gauges desired objectives. Quotas that challenge top achievers to excel and average achievers to stretch. Awards that speak directly to the target audience and reflect participants' ages, income levels, marital status, lifestyles, and relationships to your company and your product or service. Award expenses tied either directly to performance (an open-ended program) or to a predetermined budget (closed-ended program). A qualification period that's long enough to generate revenues to cover program expenses. Why isn't this being accomplished already? Who is most likely to get the job done? What will it take to motivate my target audience? How will I prove objectives are being met? How should the program be paced? Simple is superior. The closer you come to telling your target audience "Do this and get this," the better off you are. Wording of rules must be simple, straightforward, and specific. More is better. Solicit as many opinions as possible from both subordinates and superordinates on how fair and clear your rules are before releasing them to the target audience. If anybody fails to understand what you've written, rewrite the draft. Cuteness can backfire. If you're using a thematic approach--employing sports jargon, for instance--make sure the people you're trying to reach are well-versed in the lingo. You may know what it means to make a "first down" or a "hat trick," but does your audience? If they don't understand the metaphors, they won't get your message. Anticipation is everything. Think ahead. What will happen if you've designed the program so only the top 10 qualifiers win the trip, and then qualifier #10 and qualifier #11 tie? Spell out your solution. What if, in mid-campaign, you have a surplus of blue products and decide to run a spurt campaign? That's fine, as long as rules stipulate that, "Periodically, there may be changes and bonuses in this program." Surprises don't sit well with potential achievers. The value placed by your company on results (or, how much senior management is willing to spend to meet objectives). Consider your costs. There is no one formula for building an incentive budget, though every incentive budget should cover awards, communication/promotion, administration, and training/research. The first category, awards, generally eats up about 70-75 percent of the overall budget. There are a few factors to consider when allocating this figure. In general, the value of the award should be between 2 percent and 5 percent of the participant's annual income for a sales or dealer incentive; the higher the participant's income, the higher the award's value must be to spur performance. Some top executives are offered awards programs that are 10-25 percent of their incomes. The shorter the program, the higher the value of the prize should be, in order to yield quick, momentum-producing results. And the more experience your audience has had with incentive programs, the more sophisticated your award offering should be. The second biggest budget-eater is communications/promotion. One of the most common ways to deflate an incentive is to pinch pennies here. Heralding a program creates excitement, momentum, and effort. Though some programs can squeak by with 10 percent of their budgets targeted to communication/promotion and other, more complex ones allot as much as 30 percent; 20 percent is a good average to keep in mind. Administration costs require approximately 5 percent to 15 percent of your resources, depending on how extensively you want to analyze performance data and the extent to which internal employees can do the administrative work. Closed-ended programs: With "closed" rules, only a specific percentage or absolute number from the overall target audience--say, the top 25 achievers--can win awards. The advantage of such programs is the company knows the maximum costs of awards up front. The downside is that closed-ended programs can have limited motivational appeal, especially if they reward a small group of top achievers who are already highly motivated. Others may feel from the outset that they have little chance of winning and, therefore, put little effort into qualifying. If this happens, you may actually risk decreasing your target audience's overall performance. Open-ended programs: These are typical "Earn more, win more" types of campaigns. They encourage limitless performance levels and, therefore, carry broad motivational appeal. Because those in the target audience compete against themselves, not against one another, they tend to feel more in control of their ability to win. Open-ended programs are more difficult and costly to administer, however, and they usually require more elaborate promotion. And while budgetary limits can be built into the program, you can never have more than an estimate of final costs until the program concludes. If at that point your objectives have been met, your costs will have diminished; if performance has fallen short of goals, the costs will be higher and the company's profits will be lower. 4. Devise a Measurement System. Look for whatever will accurately measure the performance necessary to fulfill the program objectives. Measurements should not be at cross-purposes with your goals. If market penetration is your main objective, not profitability, don't gauge the number of units sold; measure the number of new accounts. What are the demographics and psychographics of the potential winners? Where do they live and what are their lifestyles? What is their relationship to your product or service? To your company? What would get them really excited? What other incentives have they participated in and what is their level of sophistication or expectation for awards? Ask yourself these critical questions before selecting the final prizes. Their answers will narrow down your "shopping list" to the most precise and powerful motivators. Most incentive awards fall into one of five major categories: travel, merchandise, cash, cash substitutes (certificates redeemable for merchandise or travel), and recognition items (anything from trophies or plaques to a picture on the "Hall of Fame" wall or a special parking space). Each category has its pros and cons. Some suit certain programs and groups better than others. Reflect the effort and quality of the recipient's performance. Reflect a positive image of the sponsor company. Demonstrate the importance of the accomplishment to the sponsor company. Be available in enough shapes and sizes to reward varying levels of achievement. Be fulfilled promptly, without hassle. You will quickly lose them. In fact, some experts believe you have an ethical as well as professional obligation to communicate these messages clearly and frequently during an incentive campaign. Start thinking about how to communicate your objectives and rules and promote your awards at the outset as you determine and develop each aspect of the program. Strive for a cohesive strategy that will tie every element of the campaign together in the participants' minds. A pre-announcement teaser alerting your target audience that something really special is coming their way. An announcement piece spelling out what your audience can win and how they can win it. You want it to clearly outline program objectives, rules, structure, length, and measurement systems, as well as to promote the awards and generate enthusiasm. Kickoff materials for launching an incentive program during a special luncheon or banquet, an office party, a national or regional sales meeting, or even a routine office meeting. Is it short, sweet, and self-explanatory? Does it reflect the corporate culture and company image? Does it specify program objectives? Does it promise a benefit? Does it imply urgency and incite action? Does it reflect the award offerings? Will it be easy to dramatize and promote? Does it or should it tie into a consumer marketing theme? Look at each promotional piece as part of an overall, themed unit, not as a separate tactical device. Avoid off-the-shelf themes that may be cute but don't address the target audience or your incentive goals. Send promotional pieces that are interactive and encourage commitment from the audience. Use your own resources and vehicles in your communications. For instance, if you sell fax machines, send some pieces via fax. Make sure all promotion pieces cohere and communicate the same things to everyone. Be creative in your use of communication vehicles: surveys, dimensional (items such as hats, books, or pens that tie in with your theme), radio broadcasts, faxes, videotapes, computer disks, CDs, audio cassettes, intranet push technology if available, online site access to the program, etc. If the medium is appropriate and supports your objectives, use it. Stint on the budget. The absolute minimum you should allocate to communication and promotion is 10 percent of campaign costs; 20 percent is the preferred amount. Use negatives in your promotional pieces. Always pose potential problems as challenges and opportunities. Lose sight of your participants or your objectives. Dilute your message by sending unrelated things, such as a pep piece on someone's personal letterhead rather than on the specially designed incentive letterhead. Go cheap. Poor quality sends a message that you don't really value the participant and that your company is cheap--two things that undermine confidence and determination to succeed. Throw money away. Glitzy without aim is useless. Creativity, humor, and relevance, however, go a long way toward stretching the budget and reaching potential winners. Not long ago, administering an incentive simply meant finding the clerical and programming help to generate the progress reports. Today, thanks to myriad technological advances, program administration offers a unique opportunity for sophisticated information management. The ability to compare the ongoing performance of those who are enrolled in the incentive program with those who aren't. The ability to quickly adapt your program to changes in the business environment and alert you to the need for spurt activities, bonuses, and other program enhancements. "Snapshot" summaries of what's happening in the program in different parts of the country at any given time. The ability to play out "what if" scenarios to gauge the effect of different decisions you might make. The data for intensive post-program evaluation. Administration typically eats up 15 percent of the incentive budget and 50 percent of the planner's time. Providing timely, meaningful, accurate feedback to participants not only demands a great deal of effort and paperwork, it takes the right people. No matter where administration is done, it must encompass eight key elements: enrollment services, the participant database, promotional mailings, award tracking, performance statements, management reports, earnings/tax reporting, and post-program evaluation. Program evaluation may be one of the last tasks executed in an incentive campaign, but it's actually one of the first things you should consider once your structure is in place. How else will you be able to tell whether or not the incentive was a smart investment? Many longtime incentive users can't tell. They see gains during the incentive qualification period, and reap lots of positive feedback about the awards from participants, so they assume that their programs are successful. Such assumptions, however, don't make good business sense. Detailed, bottom-line analysis does. 1. Were the objectives met? 2. Did the program and awards meet the expectations and desires of the participants? What you wanted to measure (be sure everyone agrees on this). How you would measure it. What you expected in terms of results. What your baseline (actual performance from a like period) was. Which outside elements or influences could affect the outcome of the program. It's critical to weed out any factor that might skew your analysis of the incentive's impact. Doing this, and establishing a baseline for performance from a similar period, will enable you to draw realistic, bottom-line conclusions. Whether or not your objectives were clearly communicated. How well participants understood the rules and goals. How much your training efforts affected performance. How effective program promotion was. Which awards were most popular among specific participant groups. In addition to gathering reactions from participants, solicit input from the company involved in program administration. Remember, honesty is your most important tool when conducting incentive program evaluation. It may be nice to brag about the successful aspects of a campaign, but unless you take an unflinching look at things that went awry, future programs will suffer.